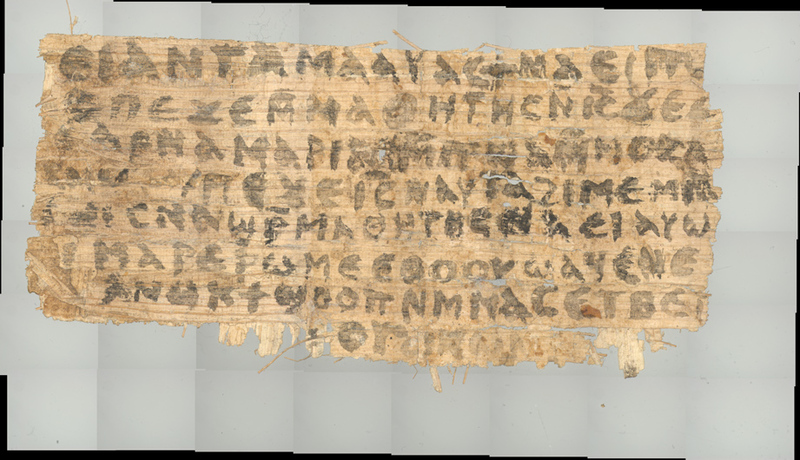 A wide range of scientific testing indicates that a papyrus fragment containing the words, “Jesus said to them, my wife” is an ancient document, dating between the sixth to ninth centuries CE. Its contents may originally have been composed as early as the second to fourth centuries. The fragment does not in any way provide evidence that the historical Jesus was married, as Karen L. King, the Hollis Professor of Divinity at Harvard Divinity School, has stressed since she announced the existence of the fragment in the fall of 2012. Rather, the fragment belongs to early Christian debates over whether it was better for Christians to be celibate virgins or to marry and have children. The fragment is weighing in on this issue, according to King. “The main topic of the fragment is to affirm that women who are mothers and wives can be disciples of Jesus—a topic that was hotly debated in early Christianity as celibate virginity increasingly became highly valued,” King explained. King first announced the existence of the fragment on September 18, 2012, at the International Coptic Congress in Rome, and dubbed it “The Gospel of Jesus’s Wife.” The use of the word “gospel” makes no claim to canonical status. The title refers to the fragment’s most distinctive claim (that Jesus was married), and serves as a short-hand reference to the fragment. Nothing is known about the discovery of the fragment—which measures only about one-and-a-half inches by three inches—but it is assumed to have come from Egypt because it is written in Coptic, the form of the Egyptian language used by Christians there starting in the Roman imperial period. The real author of the fragment is not known and would likely remain unknown even if more of the text of the Gospel of Jesus’s Wife had survived. This remaining piece is too small to know anything definite about who may have composed, read, or circulated it, except that they were Christians. “This gospel fragment provides a reason to reconsider what we thought we knew by asking what the role claims of Jesus’s marital status played historically in early Christian controversies over marriage, celibacy, and family,” King said. Like Professor King, I am excited about the theological implications of such discoveries. Only its chronological authenticity has been confirmed–not the truthfulness of what is asserted in it. Of course Jesus was married. But he was also merely a Judean nationalist, likely a follower of John, and a violent anti-Roman revolutionary. The research began by Robert Eisenman and accumulated and popularized by Reza Aslan pretty much confirms this–and lays the blame squarely on Paul for composing what is probably the most large-scale fiction in the history of civilization. Do we blame Paul or those who used Paul to those ends? Both maybe? The closer you get to Jerusalem, the lower the regard for Paul–that was well-described in Aslan’s work. Although it’s curious to try to find moral fault with any purveyor of the various Jesus narratives (too long ago and too contextually different for us to judge them), there is a huge divide between the message points of James and those of Paul. Paul’s deification of Jesus as the Christ strips Jesus of his communalist, anti-imperialist message. There is good reason to believe he purposely de-politicized the movement–and why wouldn’t he? The suffering of this world, the hierarchies and exploitations of colonialism, the blaspheming of Judaism, were all irrelevant to Paul. In starting “Christianity,” Paul buried Jesus and radical Judaism. What’s even more interesting is what would have happened to the movement if it had kept its emphasis on Jesus’s brother James, Bishop of Jerusalem, whose message was far less metaphysical and far more ethical than Paul’s. That is why the Bible needs to be interpreted with a certain level of irony. It is one of many possible narratives. As the dominant narrative, it is worth grappling with…but it is still just one of my narratives. My random thought is that from what I recall from scripture, Christ had a beard and that in order to have a beard you would have to be married. Does this mean Heavenly Father’s only begotten Son may have left behind His only begotten line that still lives today? I doubt any such line still exists. Does scripture actually describe him with a beard? I have not paid that much attention.